Evaporation and ablation are fundamental processes which drive laser-material processing performance. In applications where surface shape is important, control of the temperature field and the resulting spatially varying material response must be considered. For that purpose, assist gases are useful in, first, lowering treatment temperatures and, second, in changing interfacial and bulk chemistry to limit capillary-driven flow. Additionally, laser-matter coupling is influenced by pulse length as it determines the heat affected zone. Using infrared imaging of CO2 laser-heated fused silica and surface profile measurements, we derive temperature and time dependent pitting rates along with shapes for a range of gases that include hydrogen, nitrogen, air, and helium. In the range of 1,500–4,500 K, evaporation, flow, and densification are shown to contribute to the pit shape. Analysis reveals a strong and complex dependence of rim formation on heating time and gas chemistry, mostly by lowering treatment temperature. Under dynamic heating, chemicapillarity appears to help in lowering rim height, in spite of the reactants mass transport limitations. 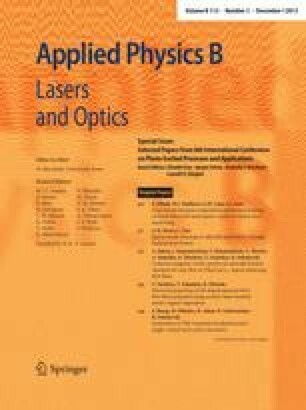 Results on this gas-assisted approach suggest the possibility for sub-nanometer “rimless” laser-based machining. This work performed under the auspices of the U.S. Department of Energy by Lawrence Livermore National Laboratory under Contract No. DE-AC52-07NA27344.